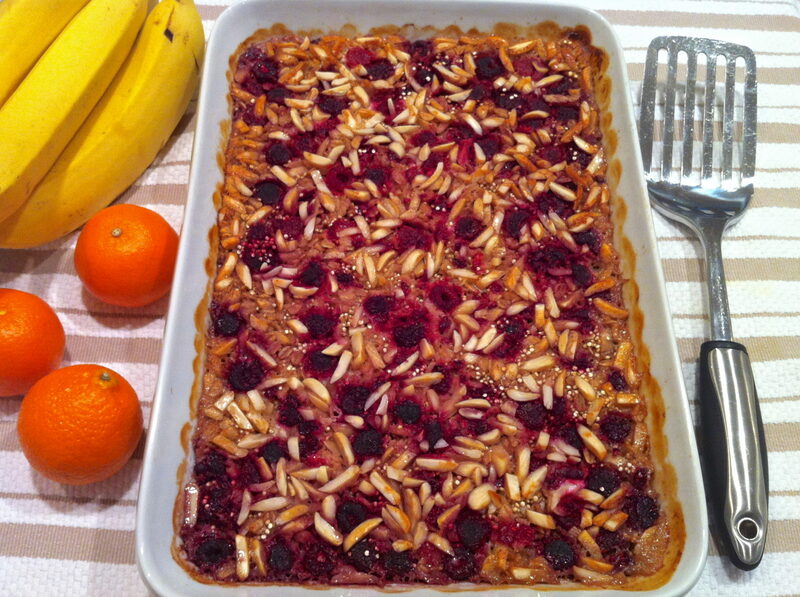 Those who have visited my kitchen, virtual or otherwise, are most likely familiar with my penchant for baked oatmeal! Months ago, I saw the idea of combining oats and quinoa from Cooking Quinoa–a fabulous resource for additional quinoa recipes, by the way–and I thought this could be an interesting spin on my standard of using all oats. I waited a while to share this recipe, however. After participating in the Smart Balance recipe contest, I thought my friends might need a break from oatmeal…although I have several more varieties I will pass along eventually! Waiting also gave me a good chance to experiment with the recipe a bit. Notably, I have made this with the banana slices on the bottom and without and prefer it with the banana. Although the flavor from the banana is minimal, it does add a nice sweetness and also serves as a good base for the quinoa. Baked oatmeals made with quinoa tend to be a bit more crumbly than those made with all oats. The quinoa will cook into the bottom layer of banana which serves as a sort of tasty glue. Even my son who is not a big fan of bananas preferred it this way. Additionally, as the fresh peaches and berries were dwindling towards the end of the summer, several people asked me if I made various recipes with frozen fruit. Generally, I tend to roll with the seasons and move on to other produce, like pumpkin. Fruit frozen at the peak of freshness is such a great option though, so I decided to give it a try. Typically, blueberries are my go-to frozen fruit, although I made this batch with frozen red raspberries and loved how they worked with the almonds. Feel free to use your favorite fruit, or a combination of several. Mixing up the nuts and/or adding coconut is something I like to do as well. If you have thoughts of a new flavor combination that sounds appealing, feel free to comment. I have a few new ideas percolating but always welcome suggestions! The possibilities with this recipe are endless. You may use all oatmeal if you are not a quinoa fan. Blueberries are another great option, and a half cup of coconut may be added to the dry ingredients. Fresh or frozen (unthawed) berries have both passed the test! I like to bake the night before, cool and refrigerate. Warm gently in the microwave for a speedy breakfast. Preheat oven to 375 degrees and grease 9×13 baking pan. Mix together the uncooked oats and quinoa, 1/4 cup almonds, baking powder, cinnamon and salt. In a separate bowl, lightly beat egg. Then add milk, honey, melted coconut oil or butter, and vanilla. Cut bananas into slices and cover the bottom of pan with them. Top with half of the berries and cover with the oat mixture. Serve plain or with a drizzle of milk or cream over the top. Add a touch of maple syrup or honey if you prefer a bit more sweetness. After much experimenting, I have found that if I use just 1/4 cups of quinoa and 1 3/4 cups oats, my kids don’t notice anything “funny” in their baked oatmeal and I enjoy the slightly nutty flavor it adds to the dish. Feel free to experiment to find a combination that you really enjoy. When in doubt, a quarter cup of quinoa is a great place to start! This recipe was shared with Recipes for My Boys’ Thursday’s Treasures. This looks amazing! I am going to try it. Thanks for the recipe! You are welcome, Melissa! I hope you enjoy one of my breakfast favorites! Hi! I found your site through Pinterest when looking for healthy breakfast options. Since then I’ve made this recipe several times – it has become one of my favorites! I love playing around with different fruits and nuts each time I make it. It’s a great recipe to make a ton of different ways. Thank you so much for sharing it! It would be helpful to have the nutritional information about this recipe. We are diabetic.